“Sometimes life hits you in the head with a brick. Don’t lose faith,” said Steve Jobs. 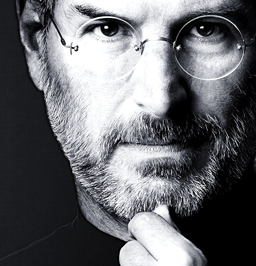 Steve was an American information technology entrepreneur and inventor. He was the co-founder, chairman, and chief executive officer (CEO) of Apple Inc.; CEO and majority shareholder of Pixar Animation Studios; a member of The Walt Disney Company's board of directors following its acquisition of Pixar; and founder, chairman, and CEO of NeXT Inc. Note: The 'Tell Me About It' Stack has had help from the GoGrid Stack to create columns. I would rather gamle on our vision than make a 'me, too' product.